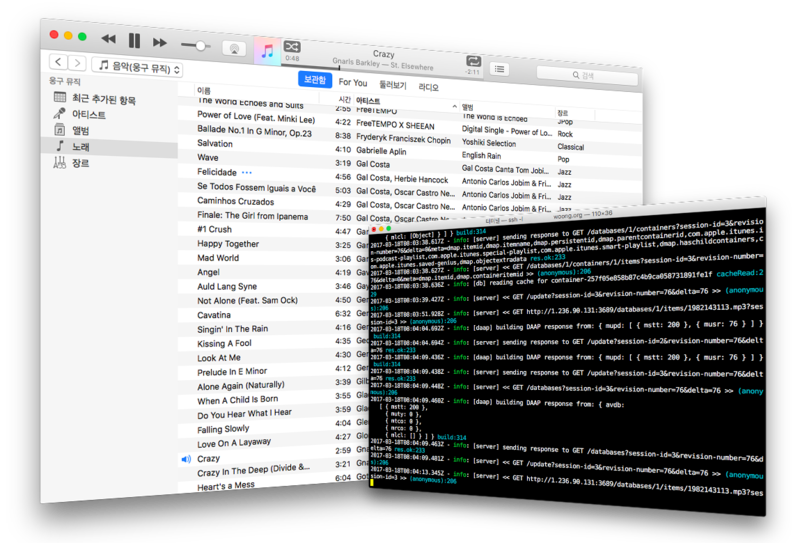 canary is a package of a music streaming server and its companion iOS client that run upon DAAP. Employing DAAP for streaming and mDNS/DNS-SD for service advertisement let canary work perfectly with iTunes. This document explains the server. See the files in the client directory for the client. please let me know about them! The initial scan of songs is fairly fast thanks to high performance of the music-metadata module; 7 mins with 4,500+ songs on my Gentoo machine with Intel Atom D525, 4GB RAM and a 5400-rpm HDD. Once the database has been built, rescanning is even faster; 30 secs on the same condition. The server remembers the mtime, modification time of files and reads only added or modified files. Nothing; MongoDB is no longer necessary! The only thing you need to run canary is a node.js environment. canary started to support a stand-alone DB, NeDB as well as MongoDB. You better depend on MongoDB, however, if a huge number of songs need to be served, because NeDB stores all its indexed data on memory. Having more than one instance of mDNS/DNS-SD service on the same machine confuses the service to prevent it from properly working. The value for mdns in server.conf (see below) chooses a service for mDNS publication. off: no service advertisement activated. If your system have avahi or dns-sd, please make sure that avahi-publish-service or dns-sd is accessible not specifying a path from the location canary runs. Whenever avahi or dns-sd fails to start, mdns-js is selected as a fallback. If you are not able to get the service advertisement to work with any of these options, please let me know to help you. Two configuration files need to be provided for the server, one for its database and the other for the server itself. debug controls the server's log level. Setting this to true makes the server verbose. One of config/db.ne.json and config/db.mongo.json is used depending on the setting of the db field above; both files must exist and be syntactically correct. The options from host to password inclusive specify basic information for DB connection. If no authentication is required, user and password can be omitted. reconnectTime specifies a time interval in seconds for which the server waits before trying to reconnect when disconnected from the DB. to specify a path into which persistent DB files go. where the -c option (or --config) specifies a configuration directory the server will use. The following DAAP clients have been tested with canary-server. If your favorite client is not on the list or does not work with the server, please open a new issue to describe the problem concisely. testing for files with various and sometimes weird meta data; metadata of my files are normalized so not enough samples to push the server's metadata handling. LICENSE.md describes the license imposed on users of canary.